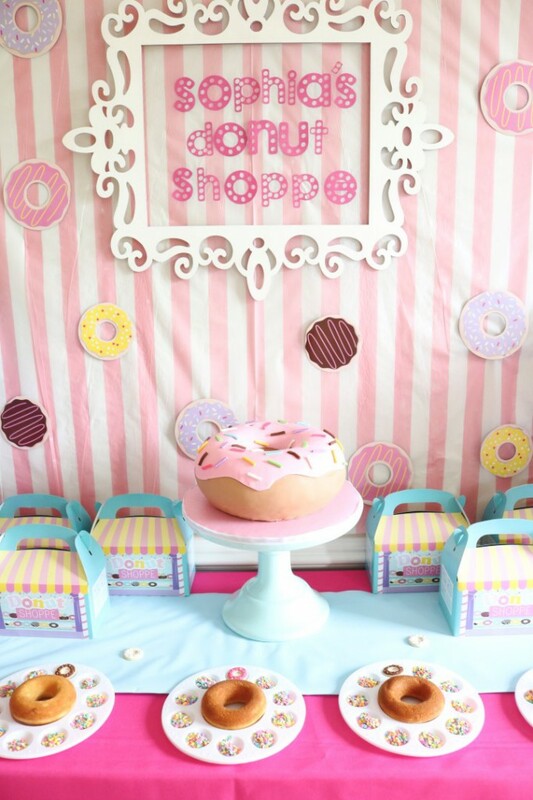 We wanted our donut shoppe to have an old fashioned donut shop feel with a pink and white striped canopy and scroll-work wooden sign. 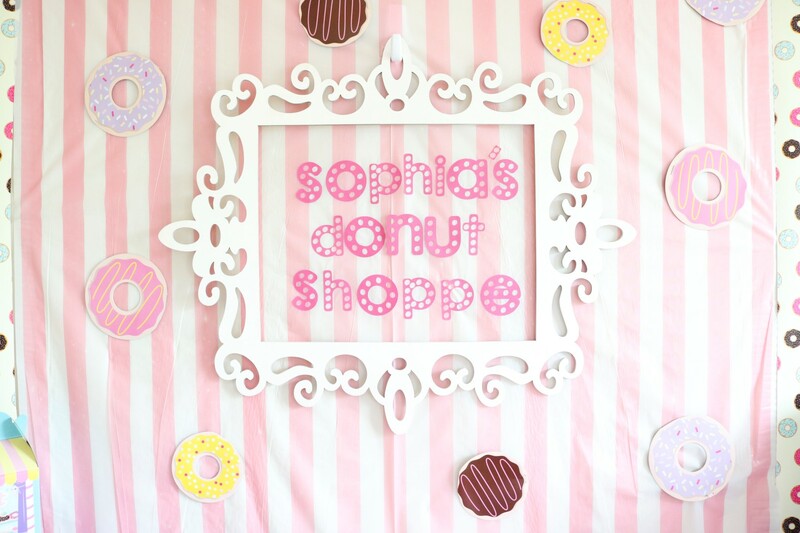 We created the font for the signage with out Cricut machine and surrounded the sign in donut cut outs. 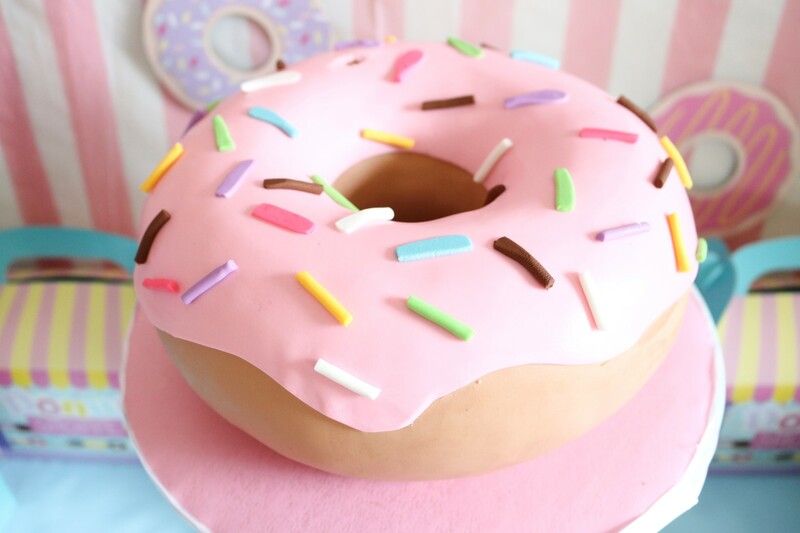 Our dessert buffet displayed an over sized donut shaped cake full of pink icing and rainbow sprinkles. 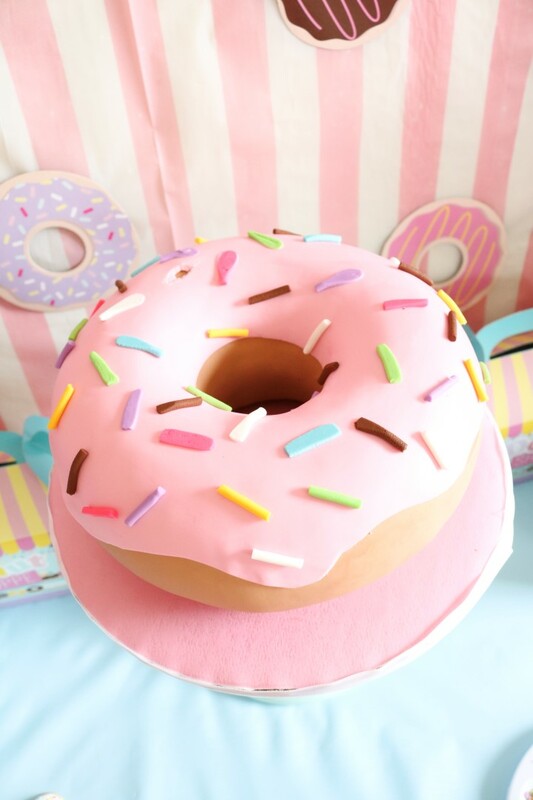 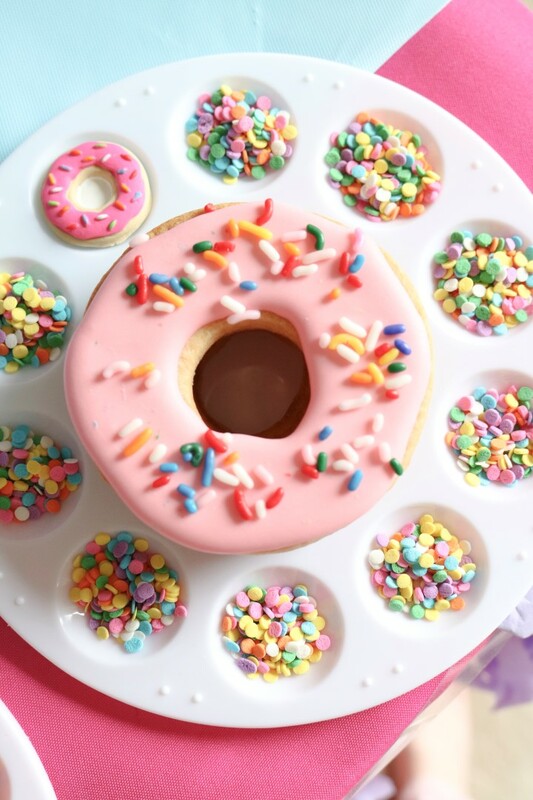 Each guest also had their very own miniature donut that they could decorate with frosting, sprinkles and candies. 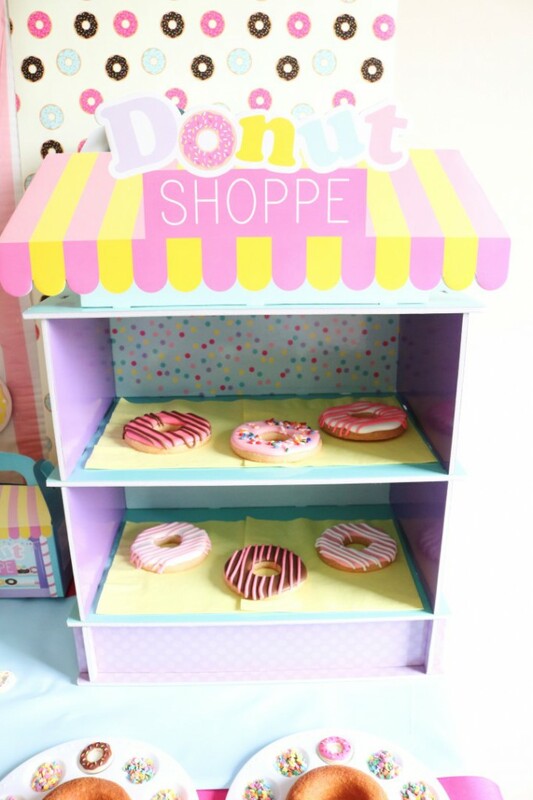 Donut shaped cookies were displayed inside a donut shop stand that sat on our dessert buffet. 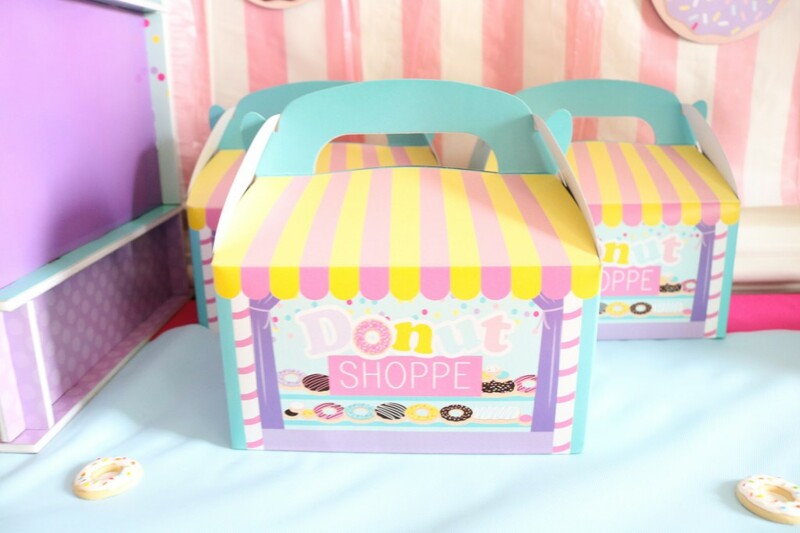 Guests could bring home their extra sweets and donut creations in these adorable donut themed gable boxes from Oriental Trading Company. 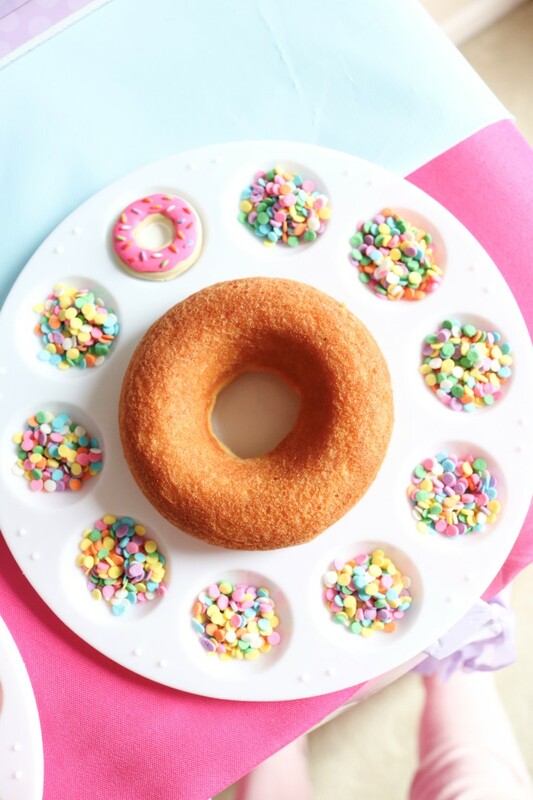 The girls enjoyed their cake and other donut themed treats on adorable sprinkle and donut plates from Oriental Trading Company. 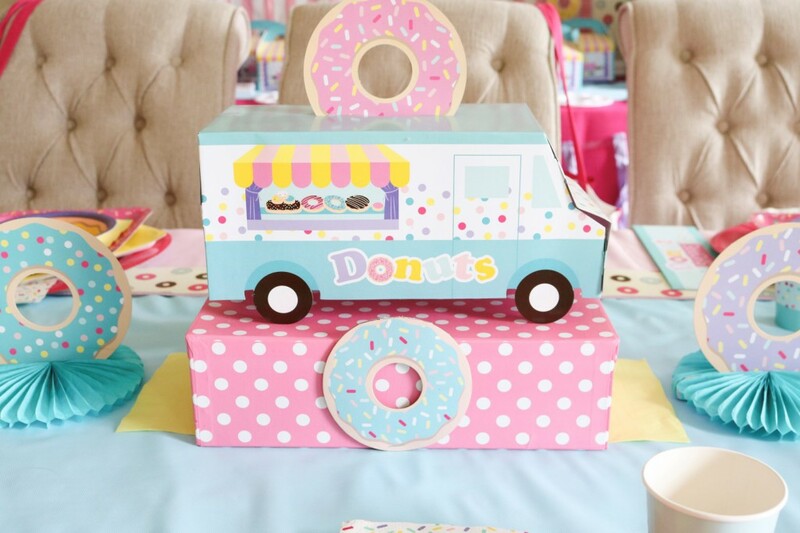 We especially loved the donut truck centerpiece from Oriental Trading Company. 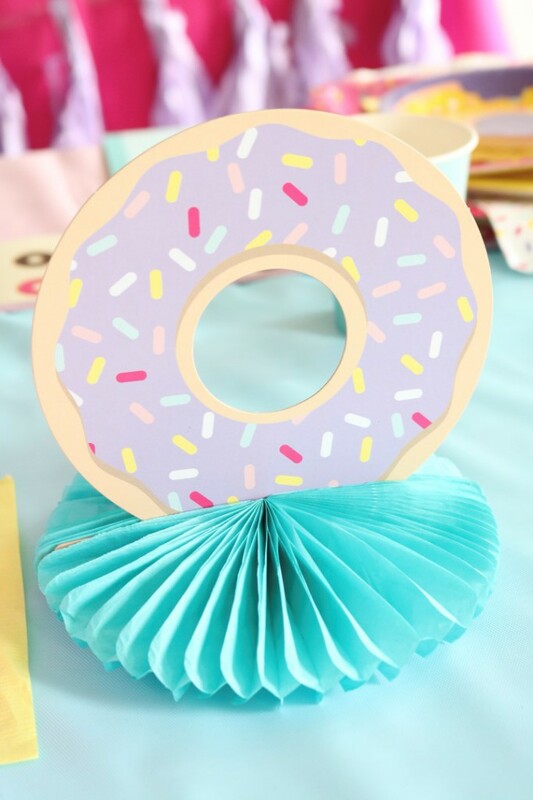 It looked perfect in the center of our table. 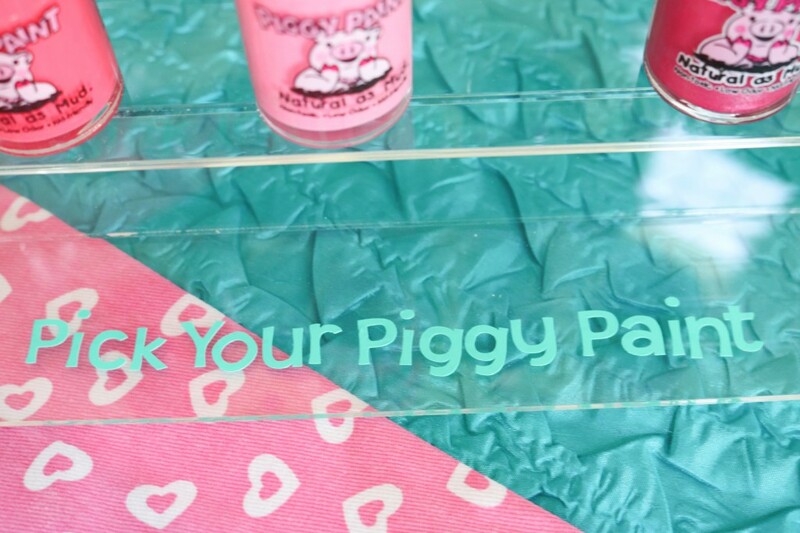 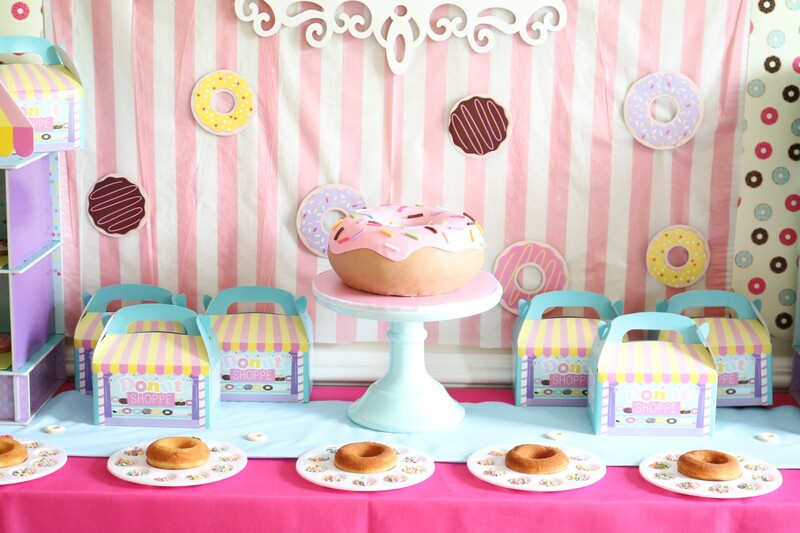 We created a donut themed nail station for the girls to get glammed up as they snacked on their treats. 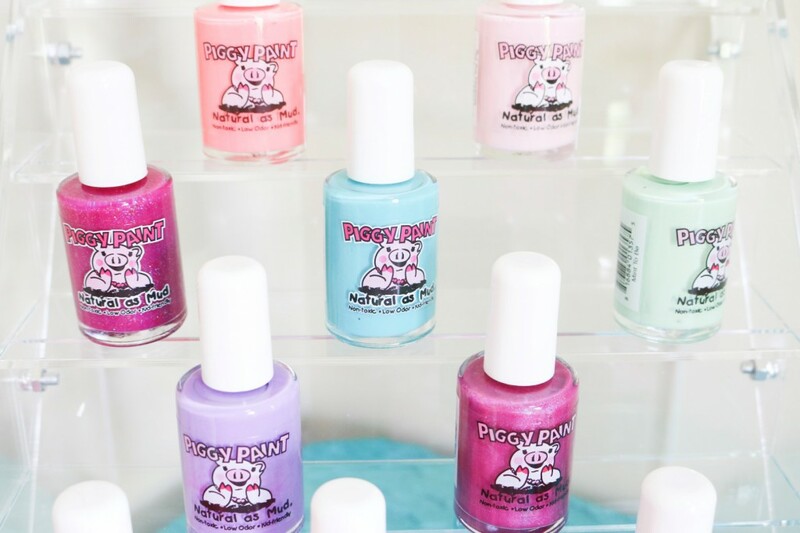 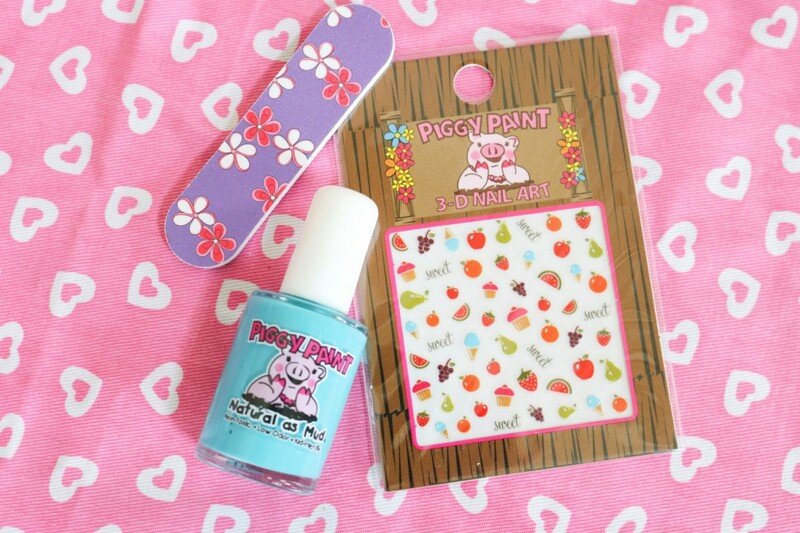 Piggy Paint Nail Polish was the perfect polish for our young girls and is SAFE! 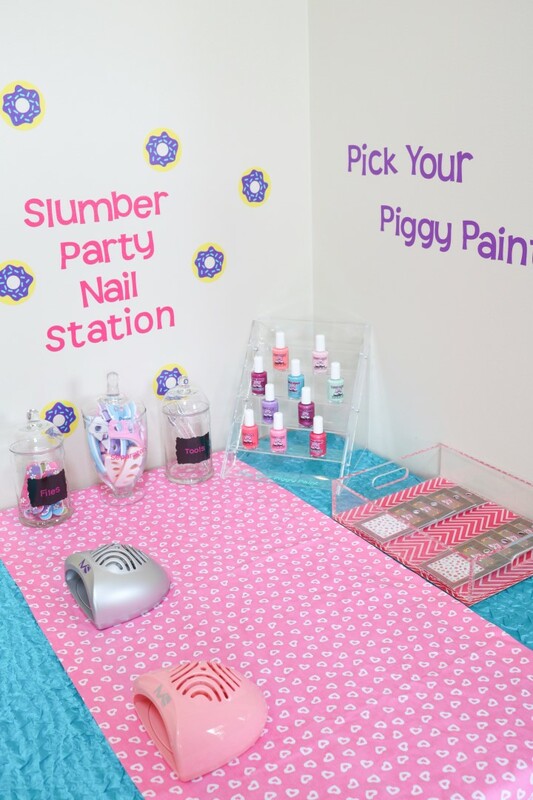 We love their adorable colors and their darling nail decals and the girls had so much fun picking out fun combinations of colors for their fingers and toes. 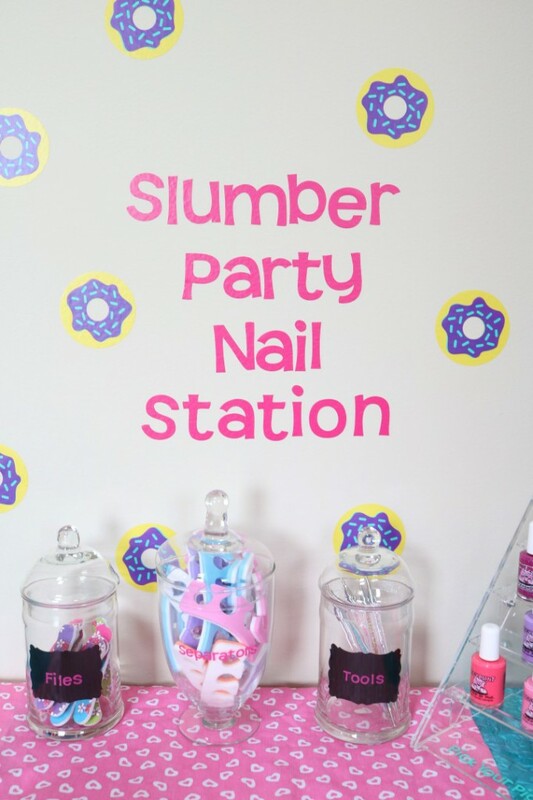 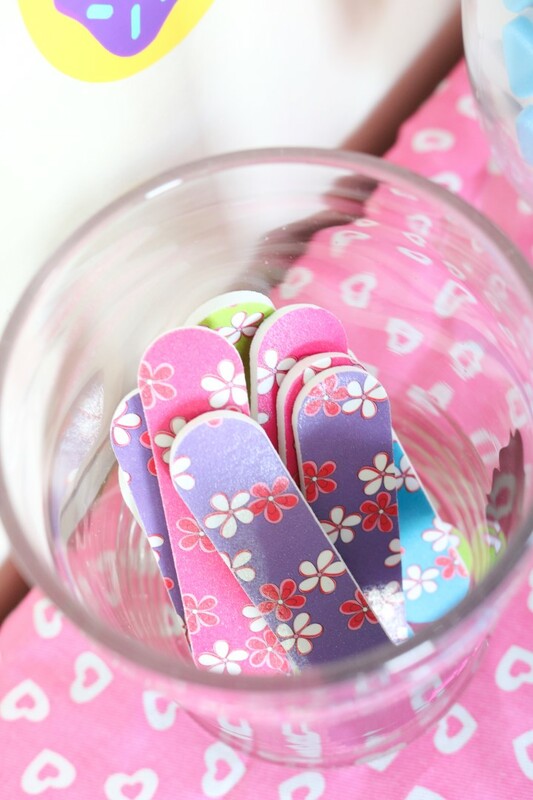 We made sure to offer up plenty of nail supplies including nail separators, nail files, painting tools and decals. 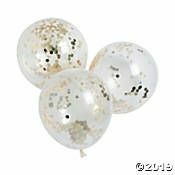 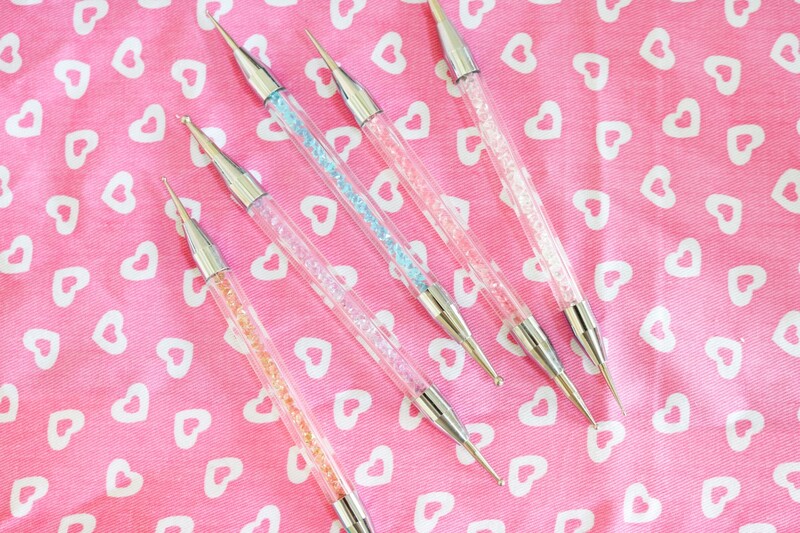 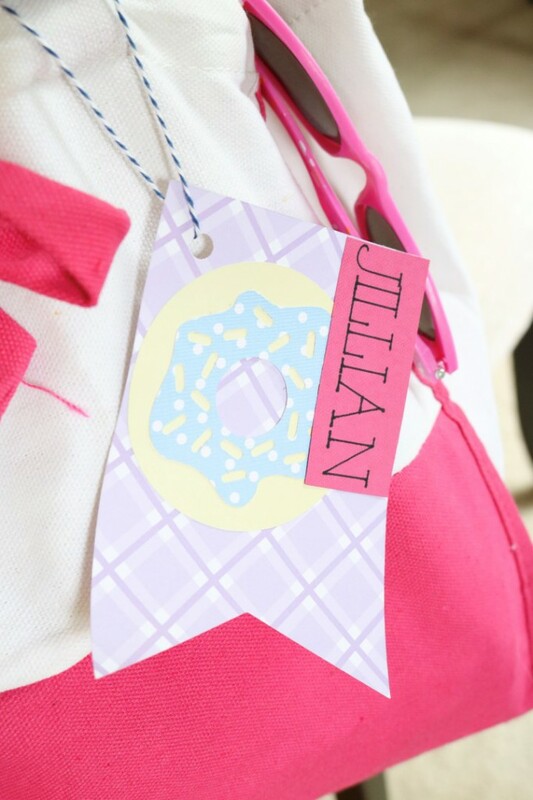 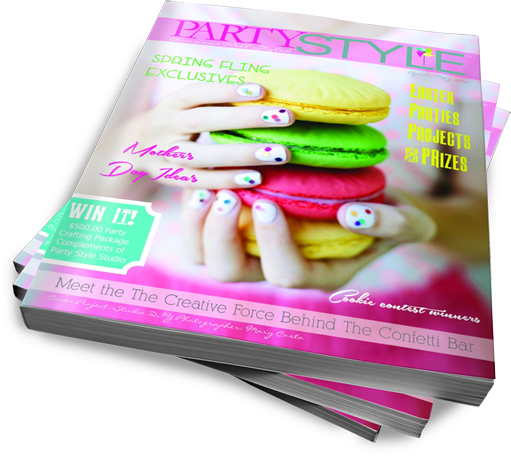 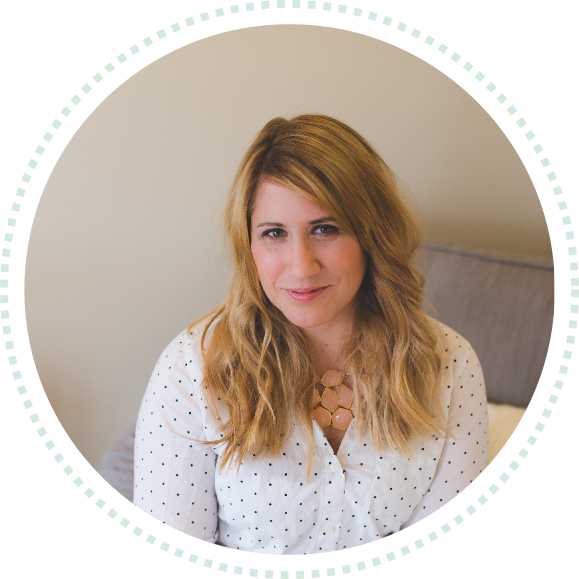 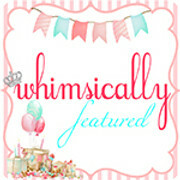 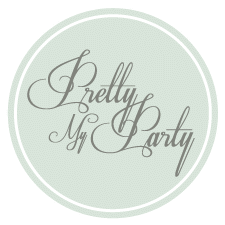 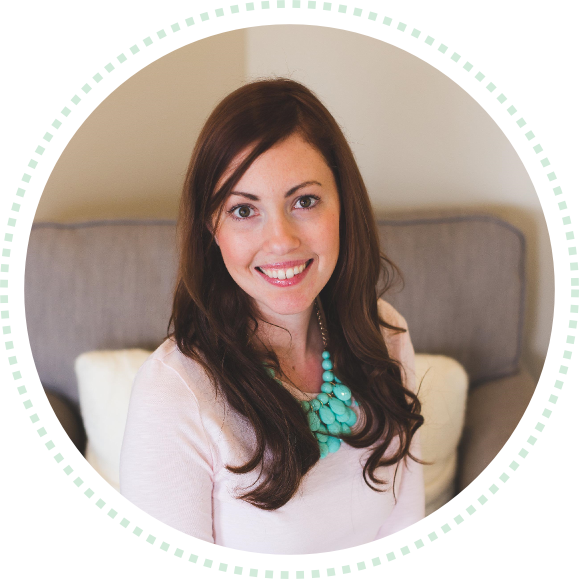 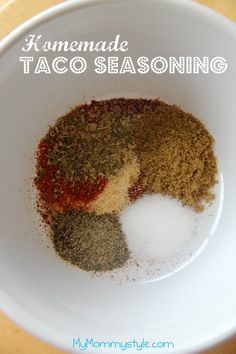 We wanted to create a fun favor for each girl to use AT the party and then enjoy at home s well. 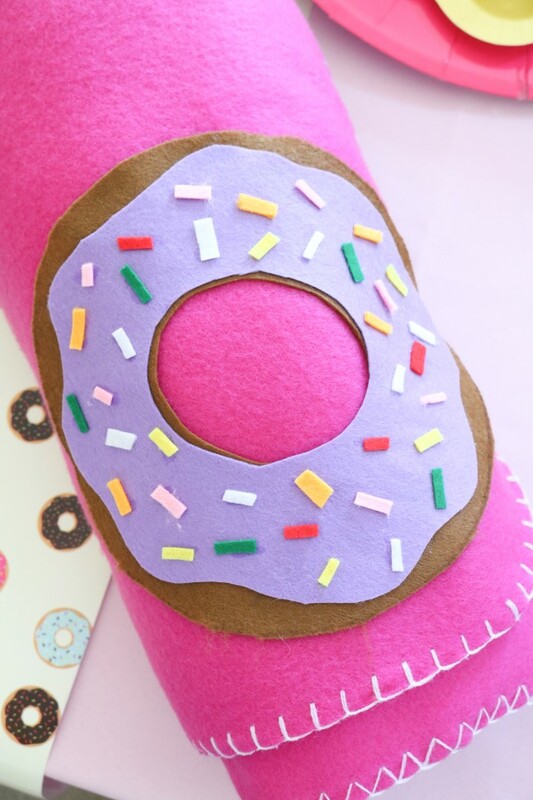 We created these absolutely adorable donut fleece blankets for the girls to snuggle with at night and then take home in the morning. 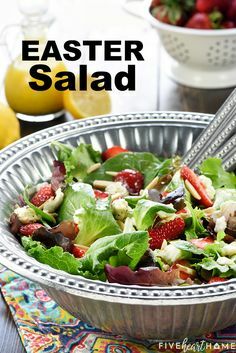 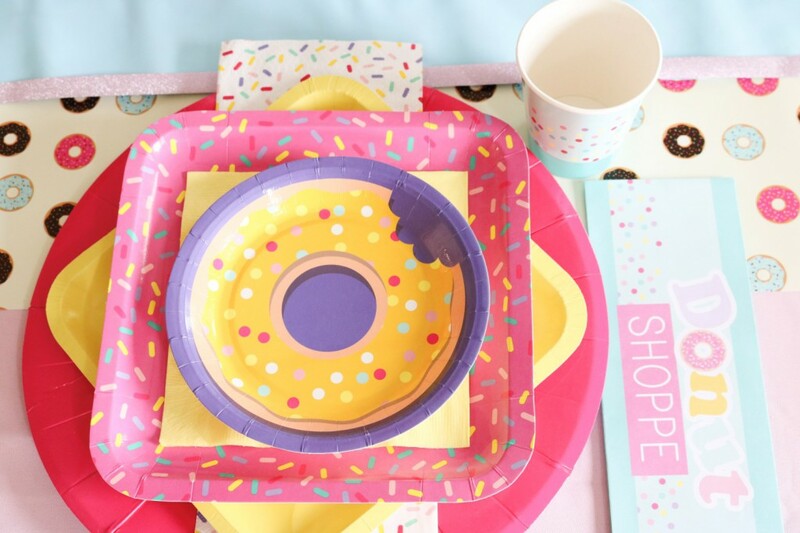 We started by cutting our some donut shapes in the girls’ favorite colors and layering them on the corner of a hot pink fleece blanket from Oriental Trading Company. 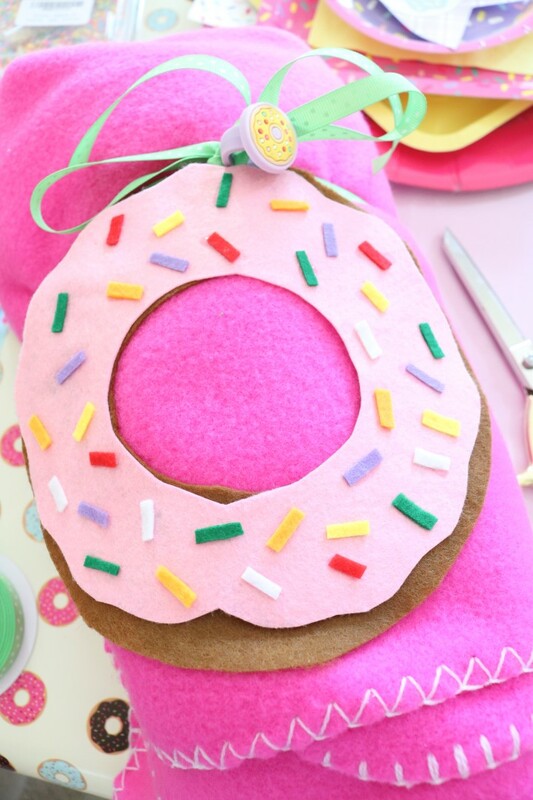 We then cut out tiny sprinkle shapes from the felt as well. 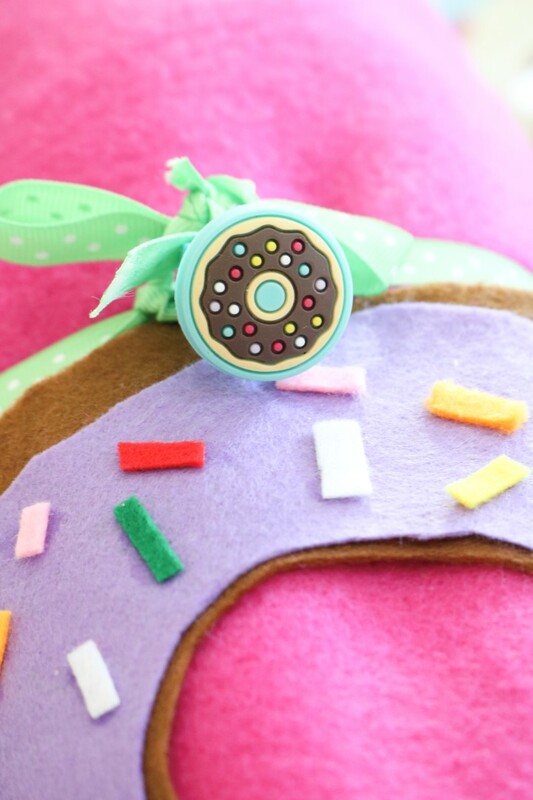 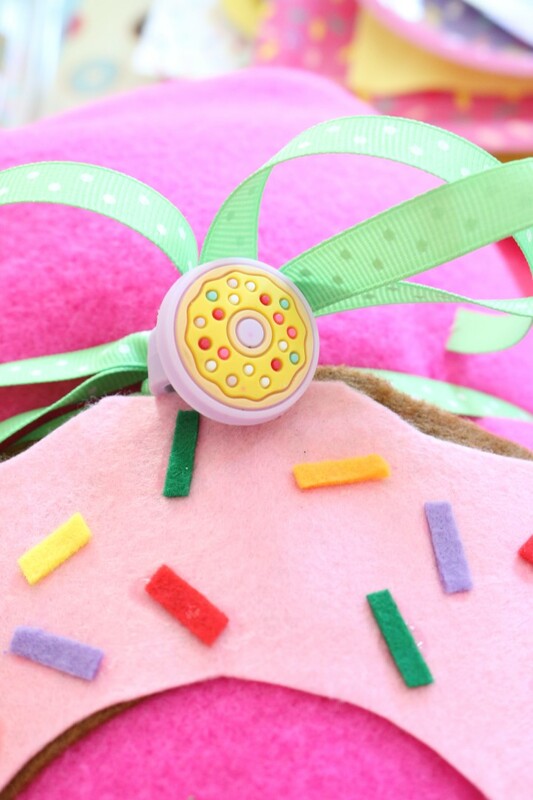 We attached the felt donut, icing and sprinkles using fabric glue and allowed it to dry in place for 24 hours. 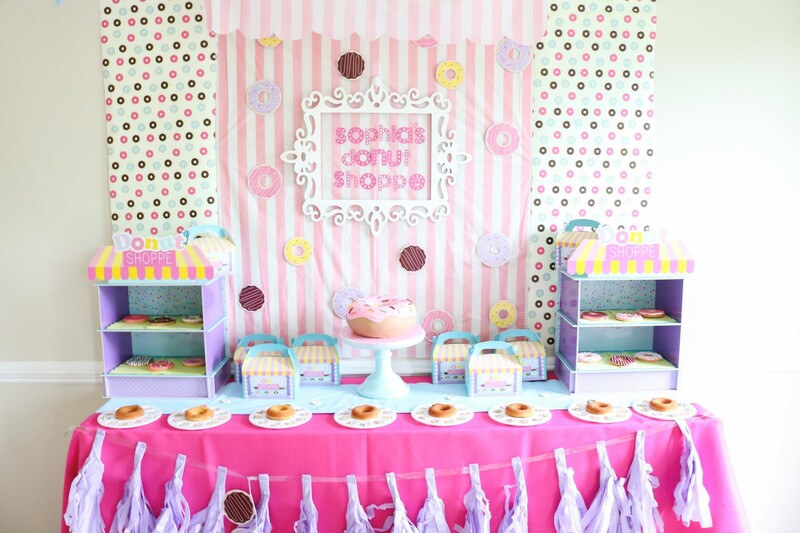 We added a cute polka dot grosgrain ribbon and a donut ring from Oriental Trading to tie up our blankets for a sweet display. 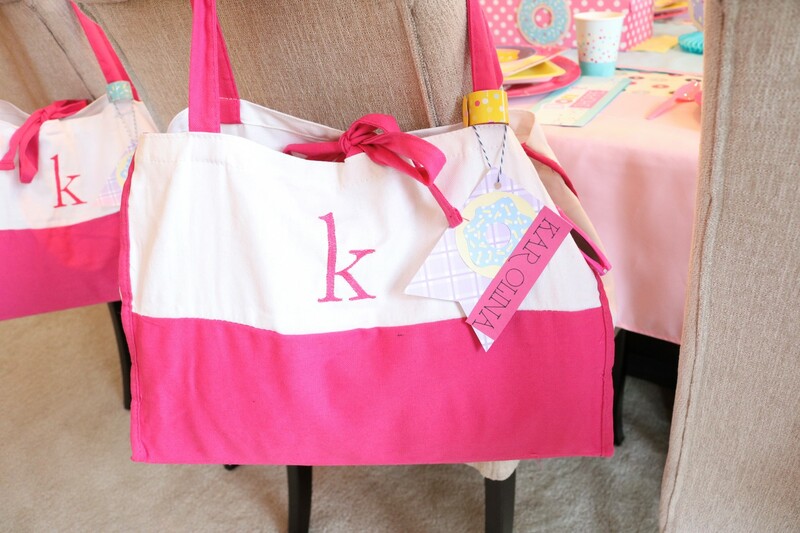 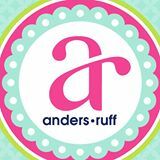 Lastly, each girl had their very own monogrammed over night bag filled with tons of goodies from Oriental Trading Company including sunglasses, bracelets, rings and more! 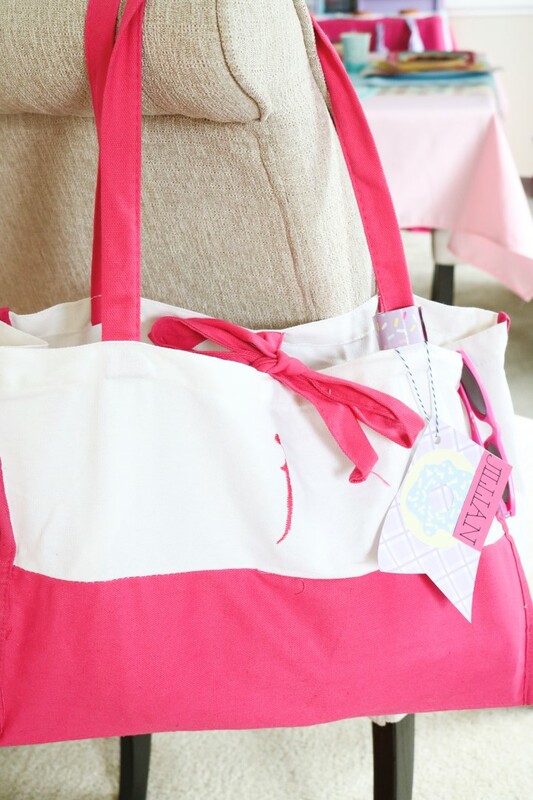 The girls loved getting these over night bags and can use them for future slumber parties as well!